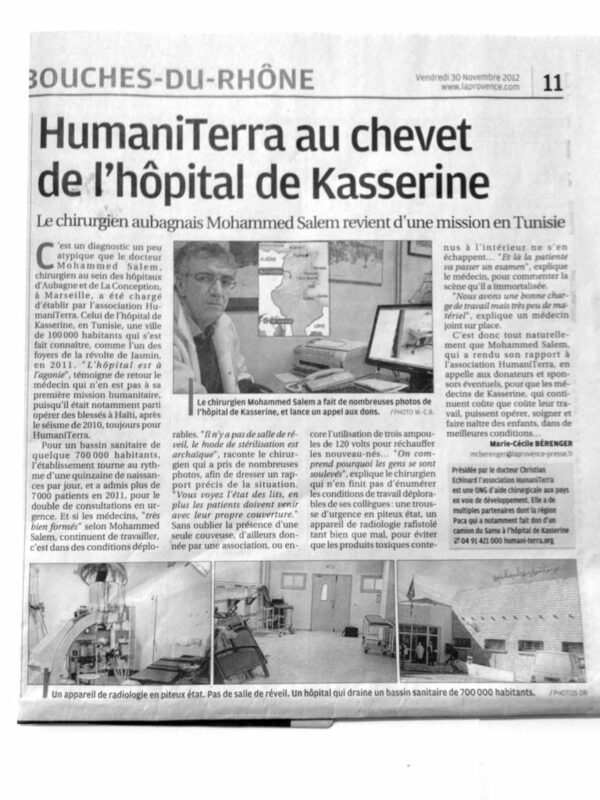 HumaniTerra has been committed to a program providing surgical care and equipment to the hospital in Kasserine, Tunisia since November 2012. This city of 100,000 inhabitants was the cradle of “Arab Spring”, which caused numerous deaths and injuries in 2011. With an unemployment rate of 40% and a governorate known for being one of the most underprivileged in the country, Kasserine neither disposes of the adequate means for maintaining its hospital facilities nor for the proper care of the population. Our actions start with a complete overhaul of the operating suite equipment and of the maternity unit of the hospital, providing both the heavy equipment and the consumables (beds, operating tables, intensive care tables for newborns, surgical equipment, etc.). Five or six surgical care missions are scheduled per year, with the priority being on lifesaving surgeries that are nearly inexistent in the city: traumatology, orthopedics, mother and child care (pediatric and gynecology-obstetrics surgery). A full program of classes and conferences is offered on site by our doctors and surgeons. Internships are organized in France to provide more in-depth training. Program funded through support from the Southeastern France Region (PACA), from the Regional Center for Disease Control in Southeastern France (ORSPACA) and from private donors.